Two Bears Farm and the Three Cubs: White Trash Pools Continued....Swimming, Anyone? 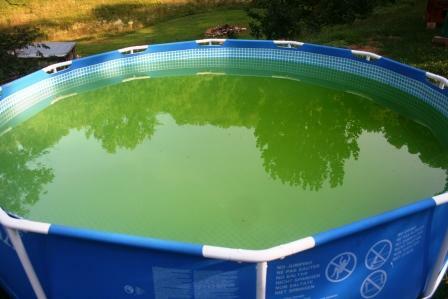 White Trash Pools Continued....Swimming, Anyone? It wasn't that we meant for the pool to get this gross. In fact, back in June when I wrote my White Trash Pools 101 post, I had no idea that we'd live up to expectations so thoroughly. Indeed, after a week of neglect and a week of temps in the mid 90s, we have this mess. Sadly, I didn't create this green shade with Picnik, folks! Guess we won't be taking a dip anytime soon. Have you entered my giveaway for beauty supplies and other goodies yet? My squash and zucchini burritos recipe is featured today in Yummy Finds on Act Fast Chef if you want to check it out. It doesn't take long for those pools to get away from a person. Good luck in getting it back to normal. Nothing a little pool shock and a skimmer can't take care of, right? This is the reason my fountain is no longer operational: too high maintenance! YOu could just call it sci-fi Friday,lol! And that is why I don't put up a pool! I have had quite a few of those in the past. They seem to just get away from you if you turn your back for a second! Sneaky things! My boys probably will still try to swim! Eh... just drain it and refill. I say throw that thing away,lol.......Just to share with you folks, i have a new post today on Amish Stories from the Terre Hill days even that was just held in Lancaster Pennsylvania. It was a very hot day but i was able to get i think a few good images from this event. The town is populated with a mix of Amish and old order Mennonites which only adds to its charm. They even have what has become famous in Terre Hill their "outhouse race". The town sits on a hill so it overlooks Lancaster farmland in almost all directions. This is one of my favorite towns to visit because its free from commercialism, so if you are looking for a really all American kind of town with the added bonus of seeing its Amish and Mennonite residents at work and play, then this town is for you. Thanks folks. Richard from Amish Stories. ACtually that is probably caused by the sun believe it or not. When the temps rise this high and the sun is directly in line with the water it causes that beautiful green huh. Still safe to swim in. But this is why I plan on going to a salt water filtration system with our next pool. None of that to worry about.. But here's hoping the water is clear again soon-without too much trouble! My kiddos wouldn't be deterred. They would jump right in! It's probably good we don't have a pool. That reminds me Lisa, I must post a recipe for pea and mint soup! What an interesting shade of green! 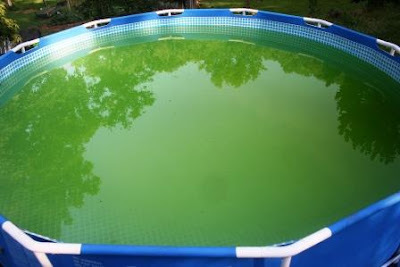 I have read that it's harder to keep a smaller pool clean than a larger one--if that's any consolation! Think I'll skip swimming in the pool! It looks like lime koolaid! :-) LOL. It doesn't take long in this heat, does it? Went and got the recipe - thanks! My veggies are doing nothing. NOTHING. I would love a real garden, but alas, we rent. So I have pots and what not, and I have never been so disgusted in my life. I've had pot tomatoes before ... but this is getting silly.